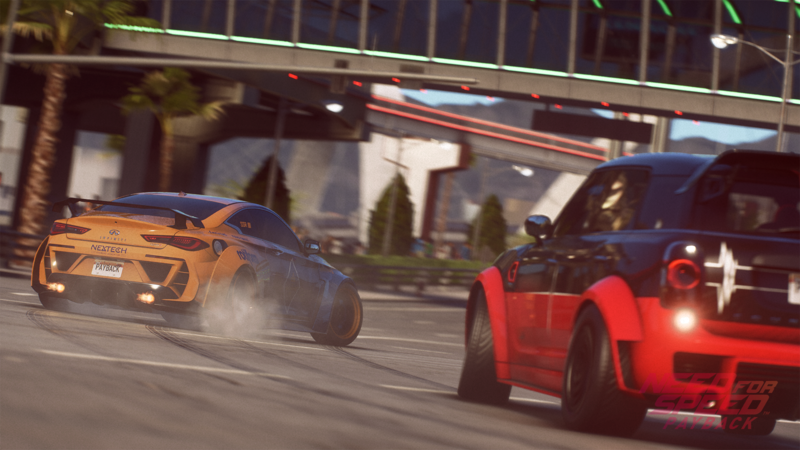 Back on January 1st we welcomed in the New Year by confirming that Free roam, or as we call it Alldrive will be coming to Need for Speed Payback. We're currently racing towards a release for the next update, which is currently scheduled for release on February 13th. What can you expect? Let's dive in. Introducing Hangout, which will allow you to explore Fortune Valley alongside your friends and other members of the Need for Speed Community. Alldrive: Hangout will allow you to show off your cars and gives you an environment to socialize. This is the place where you'll be going when you want an impromptu car meet with your friends, the place to take cool Snapshots of your crew, and the place for you to just cruise the streets (and off-road). A new item is being added to the Tune-up shop, in the form of Catch-up packs. These packs allow you to speed up the progression of your cars, meaning you can take a car from stock to top tier in a much quicker time-frame. There will be three different types of pack available, level 6, level 11 and level 16. Each one will be unlocked once you've reached a certain part in the campaign. 180,000 for the level 16 pack. New variations of both Underglow and Tire Smoke are coming. These new additions will be included in amongst the already existing options and you'll find them within Shipments once you REP up. Available for both Underglow and Tire Smoke will be; Steel blue, Candy pink, Cyan, Coral and Gold. To help improve inventory management we are adding the ability to sell or trade-in all currently unequipped Speed Cards. Simply highlight a part category and you’ll be given the ability to sell or trade-in all the unequipped cards within that category. We’ve made some tweaks and improvements to Snapshot Pro, the first one being that you can now take Snapshots while in a takedown sequence. Alongside this, we’ve increased the distance the camera can move further away from the car, giving you a little more freedom to take that perfect shot. Some minor tweaks were also made to the sensitivity, making movement across bigger distances a bit quicker. Objects in the background have had their quality level increased when you enter the mode, allowing you to take even higher quality Snapshots. The ability to toggle dirt on and off has also been included. In addition to these changes we’re also adding new filter options; cinematic, Cool, Warm, Grunge, Vintage, Desaturated, Lo-Fi, Vivid Retro, Infra Zone and Monochrome Monitor. Snapshot Pro will also be usable within Alldrive Hangouts. We've made some adjustments to the front menu. Nothing major, just small quality of life improvements to help you stay up to date with Need for Speed and to get into your chosen area (campaign or multiplayer) much quicker.